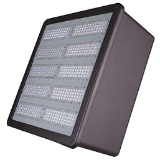 Our LED flood lights or LED area lights are a great choice for your parking lot lighting applications. We have the ability to match or improve every fixture called for in your outdoor lighting plans. We can use our standard LED lights or custom make them with special LED wattages or special lumen outputs. All of our LED lighting fixtures are ETL or UL approved and all are DLC listed, this allows you apply for and receive any and all rebates that are applicable to your area. With a full 5 year warranty and a 50,000 plus lamp life you can be confident that the product you receive will be a top of the line fixture and it will work as advertised. With most all of our LED lights made in the USA, you can feel good about supporting the American economy and still have the cost savings you are looking for and need. If you don't see what you need feel free to call us, we can support your LED parking lot lighting requirements.